Today it rained, all day! 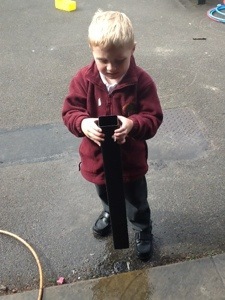 Here at Wombridge Reception we don’t let a little thing like rain stop us, we get out there and use it to help us learn! 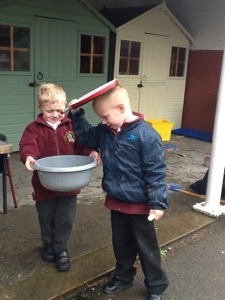 The boys thought of different ways they could stop the rain from ‘getting’ them (without the help of a hood or umbrella, of course!) 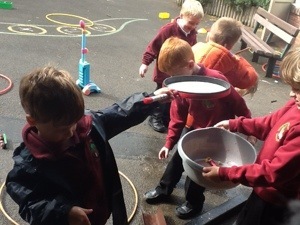 they also collected rain so they could make their own puddles. If you look at the floor carefully you might be able to see a rainbow puddle. Do you know how to make a rainbow puddle? we also watched the rain go through the drain pipe and onto the floor. I wonder what would happen if we tilted the drain pipe a little?